The RH004 Recorder Stand's 1 1/4" wooden pegs provide convenient storage of up to 36 soprano recorders and helps maintain recorders' condition as well! 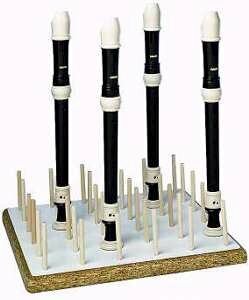 The 36-Peg Soprano Recorder Stand is equipped with 1 1/4" wooden pegs that provide convenient storage for up to 36 recorders. Helps dry out and maintain the recorders' condition as well. If you have any questions about this product by A Day's Work, contact us by completing and submitting the form below. If you are looking for a specif part number, please include it with your message.